Jussie Smollett (b. 1982) is a Hollywood actor, singer, director and photographer. Since 2015 Smollett starred in the Fox drama series Empire. He began his career as a child actor in 1987 starring in commercials and films, including The Mighty Ducks (1992) and Rob Reiner's North (1994). Smollett has also appeared in Ridley Scott's science fiction film Alien: Covenant (2017) and in Marshall (2017) as the communist author Langston Hughes. In 2007, Smollett was convicted of giving false information to law enforcement. In 2019 Smollett was charged with 16 felonies in connection with an elaborate hate crime hoax. In a surprise on March 26, 2019, prosecutors in Democrat-controlled Chicago dropped all the charges against Smollett, prompting Mayor Rahm Emanuel to take the unusual step of decrying Chicago corruption. Despite the public interest in the case the judge granted a motion to seal the records and thereby prevent public scrutiny – the Chicago police released the files regardless. This incident highlighted the connections between the prosecutor and George Soros. Kamala and Jussie. Kamala introduced legislation to make lynching a federal crime; Jussie allegedly faked his own lynching threat to draw attention to the bill. According to Jussie Smollett, he was out grabbing a sandwich at 2 am in seven degrees temperature at a Subway sandwich shop in the Windy City when he was set upon by two white thugs. The attackers, allegedly called him a "f****t", "n****r", and told him "This is MAGA country!" before punching him, kicking him, dousing him with bleach and putting a noose around his neck. Kamala Harris immediately tweeted that the attack was a "modern day lynching." (More than one news outlet claimed Smollett reported the alleged assailants were wearing MAGA hats, but Smollett denied ever alleging this.) The attackers wore red hats. Sen. Kamala Harris, who is running for the Democratic party nomination in the 2020 presidential election, sponsored an "anti-lynching bill" in the Senate to make lynching a new federal crime in late December 2018. The bill had always previously stalled in the Senate, because it was seen as an unnecessary political gimmick, meant to remind people of historical black oppression in the South. Murdering people with a rope has always been a crime under state law. In the wake of Smollett's faked "noose assault" in Chicago on January 29, Harris's anti-lynching bill unanimously passed the Senate on February 14, 2019. Harris finally laid claim to a legislative accomplishment, but the bill has yet to pass the House of Representatives. Chicago Police determined that Jussie Smollett paid two Nigerian-American (i.e., black – not white) brothers, acquaintances $3,500 to "assault" Jussie in a rehearsed "attack." The brothers produced a receipt for purchase of the rope with money they got from Smollett. Smollett claims victim status in two liberal identity groups; those within blacks and those within people of bisexual orientation. Mainstream media bought the hoax hook-line-and-sinker. ABC News's Robin Roberts of Good Morning America proved the most gullible (among dozens of others). On February 21, 2019 Smollett was arrested by Chicago Police for trying to instigate a race war. Smollett hired the public relations firm of Sunshine Sachs, whom liberal Hollywood mogul Harvey Weinstein hired to help defend him amid claims that he sexually assaulted multiple women. The motivation cited by police was greed. Smollett evidently was not satisfied with his salary in Hollywood, and by claiming to be a victim of Trump supporters would guarantee a raise in Hollywood. After being mugshot and fingerprinted, Smollett was released on $100,000 bail where he returned to work on the set of Empire. Co-workers were reported to be furious and demanded his firing. ↑ Morton, Victor (February 19, 2019). Jussie Smollett was convicted of providing false information to law enforcement in 2007. The Washington Times. Retrieved February 20, 2019. ↑ Caralle, Katelyn (February 20, 2019). Jussie Smollett lied to police during DUI stop in 2007. Washington Examiner. Retrieved February 20, 2019. ↑ Kirkwood, R. Cort (February 22, 2019). Smollett Lied to Cops in 2007, Could Face Federal Mail-fraud Charges. The New American. Retrieved February 22, 2019. ↑ Caplan, Joshua (March 26, 2019). Jussie Smollett Has All Charges Dropped Against Him. Breitbart News. Retrieved March 28, 2019. Sager, Jason (March 27, 2019). Jussie Smollett hoax charges dropped, but federal investigation, lawsuits could be next. Fox News. Retrieved March 28, 2019. Berger, Judson (March 28, 2019). DOJ, FBI to review ‘outrageous’ Jussie Smollett case, Trump says. Fox News. Retrieved March 28, 2019. Spiering, Charlie (March 28, 2019). Donald Trump: Dropped Jussie Smollett Charges ‘An Embarrassment to Our Nation’. Breitbart News. Retrieved March 28, 2019. ↑ Chakraborty, Barnini (March 27, 2019). Chicago police release files in 'Empire' star Jussie Smollett case, day after charges dramatically dropped. Fox News. Retrieved March 28, 2019. Patrick, William (March 27, 2019). Smollett Case Highlights Prosecutor’s Ties to Billionaire Donor Soros. The Epoch Times. Retrieved March 28, 2019. Pollak, Joel B. (March 26, 2019). George Soros Spent $408k on Kim Foxx, Prosecutor in Jussie Smollett Case. Breitbart News. Retrieved March 28, 2019. Prosecutor Who Dropped Smollett Charges Was Given $400K By George Soros. One America News Network. March 27, 2019. Retrieved March 28, 2019. Rchardson, Valerie (March 27, 2019). 'Indefensible' Jussie Smollett deal lands Soros-backed prosecutor Kim Foxx on hot seat. The Washington Times. Retrieved March 28, 2019. Caplan, Joshua (March 28, 2019). Kim Foxx Spoke at Fundraiser Hosted by George Soros Son this Month. Breitbart News. Retrieved March 29, 2019. ↑ 8.0 8.1 "Jussie Smollett FULL Interview on alleged attack | ABC News Exclusive" (February 15, 2019). YouTube video, 16:35, posted by ABC News. ↑ Marshall, William (February 19, 2019). "Jussie Smollett: A case study in modern liberalism". Townhall website. 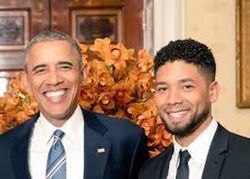 Was Kamala Harris part of the Jussie Smollett hoax?, By Monica Showalte, American Thinker, February 18, 2019.